Sometimes you just have to look in awe at a special edition Range Rover taken to the extreme. The 2016 Holland & Holland Range Rover Autobiography Black is one such car. It’s a little beyond the price range of the casual buyer, costing a simply epic £180,000, but then it is the crème de la crème and comes with a shotgun case, if that matters to you. It’s a collaboration between Land Rover’s Special Vehicle Operations division and the legendary English gun manufacturer, so only country gents or Premiership footballers need apply. The car is based on the long-wheelbase Range Rover Autobiography, which costs a whopping £140,000 in standard trim. 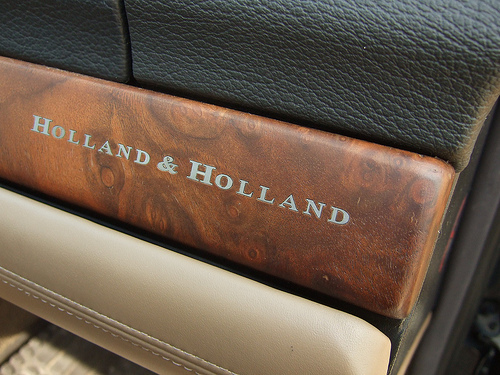 Then SVO and Holland & Holland went to work on the luxury touches. The paint is a bespoke shade of green (which means it would be a nightmare to scratch the car if you took it out shooting), a new grille, chrome headlights and unique badges that give a nod to the gun manufacturer. Inside, the car gets executive class seats that look like business class seats on a plane; there is a vast expanse of walnut trim and special premium leather that again is a tribute to the legendary guns. A leather-trimmed shotgun case is in the rear, so you could take it out shooting if you really want to. We suspect that most of these cars won’t get too close to a grouse shoot on a country estate, however. In fact, you won’t see many of them anywhere. Land Rover plans to build just 40 over three years and it’s likely to be a niche market that goes for this car. It is not the first time Land Rover has teamed up with the gun company, though, and with their outdoor heritage it’s a nice PR piece they roll out regularly to show that despite its widespread adoption in the city, the Range Rover is still a country boy at heart.